In this March 19 photo, Manila Water President Ferdinand dela Cruz (center) attends the Senate inquiry into the water shortage in Metro Manila and Rizal. MANILA, Philippines — Customers of Manila Water in the East Zone concession area will not have to pay the minimum or basic charge for March because of service interruptions this month, the concessionaire announced Tuesday. "We are announcing a voluntary and one-time bill waiver scheme to be reflected in the April bill of our customers," Manila Water president and CEO Ferdinand dela Cruz said in a press briefing Tuesday. The basic or mimimum charge covers the first 10 cubic meters consumed each month. Dela Cruz said homes use around 30 cubic meters of water a month on average. He said the one-time bill waiver scheme would benefit lifeline or low-income residential customers as their minimum charge is also their monthly charge. "This minimum charge ranges for our lifeline customers of P76 but it also goes to all kinds of customers — lifeline, domestic, semi-domestic, commercial, industrial so it ranges from P76 to P656 for industrial customers, which represents the 10 cubic meters," Dela Cruz said. Manila Water also announced that those living in severely-affected areas will have their whole March consumption waived. "Para naman po sa pinaka-naapektuhan or the most severely-affected barangays without water for 24 hours for more than a week, they will not be billed for their whole water consumption for March," the Manila Water official said. Dela Cruz clarified that Manila Water would have to conduct field validation first before determining the list of areas with fully-waived bill and those with minimum water charge. With the bill waiver scheme, Manila Water seeks to acknowledge the widespread inconvenience that the "unprecedented" water shortage that their customers experienced. Manila Water assured its customers that is continuing to focus on service recovery efforts. "As of last night our eight to 12 hour availability at ground floor level has reached a little over 97 percent. 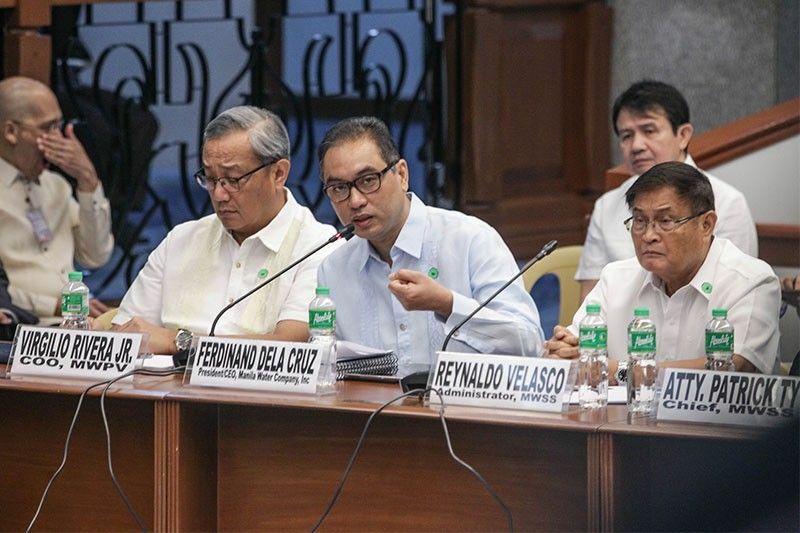 From a high of 61 hard-hit barangays, we are down t to eight hard-hit barangays which are still dependent on interim water network solutions, static tanks or water tanks," Dela Cruz said. The Metropolitan Waterworks and Sewerage System said the waiver is a "voluntary action" on the concessionaire's part and is separate from the penalties that Manila Water faces for failure to meet commitments under the concession agreement. "As far as MWSS is concerned, we have other things under the concession agreement. That will be up to the Regulatory Office," MWSS Administrator Reynaldo Velasco said at the same brieifing. "Siguro wag na tayo mag-demand ng mas malaki," he says as he emphasizes the waiver by Manila Water is voluntary. Manila Water customers led by Bagong Alyansang Makabayan Secretary General Renato Reyes have filed a petition before the MWSS asking for penalties on the water service provider. The petitioners stressed that Manila Water should be be penalized for "failure to comply with its service obligation on continuity of supply."